Birmingham boss Steve Bruce believes he is the right manager to revive the relegation-threatened club after their FA Cup humiliation by Liverpool. 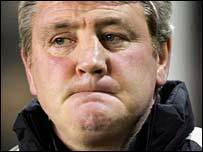 "I will analyse myself but I want to turn it round," said a shell-shocked Bruce after Liverpool's 7-0 victory. "I'm not going to take anything for granted and questions will be asked. "The board have always been good to me but I still think I'm the right person to see it through. The one thing I am is resilient and I will need to be." Bruce, whose team are currently third from bottom in the Premiership, added that the Cup defeat was the worst he had suffered in 25 years as a player and a manager. "Sometimes football kicks you in the teeth - and certainly that is the biggest one I have taken," he added. "I'm shell-shocked, disappointed and humiliated. It was men against boys, a result possibly waiting to happen with the patched-up side we have got. "It's possibly the worst night I have ever experienced, certainly in management, and with the players there are a lot of dented egos in the dressing room - and my ego is dented as well. "There is very little you can say to them. They are absolutely humiliated. "You have got to try to go again. It's going to be a long 24, 48 hours but the one thing about football is there is another game around the corner. "We have got Manchester United coming up and Chelsea after that. It's going to be a big test for us all, myself, my staff and my managerial ability to try to lift everyone if I can but I am determined to try to do it. "Have I the backing of the board still? You will have to ask them that. It is hard for me to answer that. It is a question for the board themselves." Liverpool manager Rafael Benitez believed luck played a part in his side's victory. "I'm delighted with the final result and the performance of the players," said the Spaniard after witnessing his biggest win as a manager. "Sometimes you cannot score goals after 30 attempts - as against Charlton - but here every time we shot it was a goal. "We have quality. The strikers are really good and, in this case, we had a lot of luck. "If you are losing 2-0 inside five minutes, it is very difficult. They did a lot of things to try to score but at 3-0 it was virtually impossible for them to win. "You try to go forward, you leave spaces and we have also done a good job. "We are closer to the final and we will try to do the same things, play well, but in one game anything can happen."